l. The human writers of the Bible repeatedly claim they are transmitting the Word of God, which is an amazing claim for any writer to say. 2. If the writers of the Bible are not transmitting the Word of God, then they are lying or insane or both. 3. Nevertheless, the Bible is the most influential book of the ages, containing the most perfect moral code ever devised, and containing some of the most beautiful literature ever written. 4. It would be very strange for such a book to have been written by men who were lying or insane. Therefore we must conclude that when the writers of the Bible claim to be transmitting the Word of God, they were telling the truth. a. Ezekial' s prophecy against Tyre (Ezek. 26:1-14) c. 587 B.C. 1) (vv. 7-11) Literally fulfilled in 571 B.C., when Nebuchadnezzar, King of Babylon, captured the city after a 13 year siege, leaving the city in ruins. 2) (vv. 4, 12, 13, 14a) Some of the people of Tyre escaped to an island off the coast and built a near city there. In 332 B.C., Alexander the Great, desiring to conquer this island city, built a causeway about 60 meters wide from the remains, ruins, walls, houses, and temples of the ancient continental. city of Tyre, thus fulfilling Ezekial 26:12. The old city has never been rebuilt, but has remained like the top of a rock, and is a place where fishermen spread their nets, thus fulfilling Ezekial 26:14.
b. Ezekial's prophecy against Sidon (Ezek. 28:20-23). 1) Sidon was a great and prosperous city under the Persians until 351 B.C. when it was besieged after a rebellion against Artaxerxes Ochus. With the rebellion a failure, 40,000 of its citizens chose death rather than submission to Persia. 2) Sidon was attacked and destroyed during the period of the Crusades (1107, 1249, 1260, 1291). 3) As late a 1840, Sidon was attacked by the fleets of England, Austria, and Turkey. 4) Sidon still exists, as a modern city of about 20,000 people. a. Worldwide dispersion and persecution of the Jews for failure to obey the Word of God (Deuteronomy 28:63-68). b. Samaria was to be overthrown at the hand of the Assyrians, but Judah was to be preserved (Isaiah 7:6-8; Hosea 1:6,7) - Literally fulfilled by the capture of Samaria by the Assyrians in 722 B.C., as prophesied by Hosea around 785 B.C. c. Babylonian captivity of the Jews for 70 years as prophesied by Jeremiah around 607 B.C.. It was fulfilled when the Babylonians, under Nebuchadnezzer captured Jerusalem 586 B.C. (Jeremiah 25:8-11). d. The rebuilding of the temple in Jerusalem under the Persian king Cyrus in 519 B.C. (Ezra 6:3) was prophesied by Isaiah in 712 B.C. (Isaiah 44:28; 45:1), even to the name of the king. e. The destruction of the temple was prophesied by Christ (Mt. 24:1, 2). This was literally fulfilled in 70 A.D. when Roman soldiers under Titus destroyed the city of Jerusalem. Jewish tradition states that the gold from the temple was melted as the temple burned and crept into the spaces between the stones of the temple walls. To recover the gold, the Roman soldiers literally took down the walls of the temple stone by stone. f. The regathering of Israel as a nation was predicted by Ezekial (Ezek. 37:11-28), as was the rebuilding of the land (Ezek. 36:33-35). a. His preexistence (Isaiah 9:6; John 1:1,2; 8:58). b. His virgin birth (Isaiah 7:14; Mt. 1:18-25). c. The time of His coming (Dan. 9:24-27; Gal 4:4; Luke 2:1). d. The place of His birth (Micah 5:2; Mt. 2:1; Luke 2:4-6). e. The fact that He would be preceded by a messenger (Malachi 3:1; Mt. 11:7-11; John 1:23). f. The fact that He would make the blind to see (Isaiah 35:5,6; John 9:6-11). g. His rejection by the Jews (Isaiah 53:3; Psalm 69:8; John 1:11, 12). h. His betrayal by a friend (Psalm 41:9; John 13:18; 21; Mt. 26:49, 50). i. His being sold for thirty pieces of silver (Zechariah 11:12; Mt. 26:15). j. His silence under trial (Isaiah 53:7; Mt. 26:63; 27:12-14). k. His crucifixion (Psalm 22:1-18; Mt. 27:33-50). The crucifixion of Christ is describes in Psalm 22. Note how the actual details were filled. Psalms 22:18 They part my garments among them, and cast lots upon my vesture. Psalms 22:7-8 All they that see me laugh me to scorn: they shoot out the lip, they shake the head, [saying], He trusted on the LORD [that] he would deliver him: let him deliver him, seeing he delighted in him. Mt. 27:39-43 39 And they that passed by reviled him, wagging their heads, 40 And saying, Thou that destroyest the temple, and buildest [it] in three days, save thyself. If thou be the Son of God, come down from the cross. 41 Likewise also the chief priests mocking [him], with the scribes and elders, said, 42 He saved others; himself he cannot save. If he be the King of Israel, let him now come down from the cross, and we will believe him. 43 He trusted in God; let him deliver him now, if he will have him: for he said, I am the Son of God. Psalms 22:14-15 I am poured out like water, and all my bones are out of joint: my heart is like wax; it is melted in the midst of my bowels. My strength is dried up like a potsherd; and my tongue cleaveth to my jaws; and thou hast brought me into the dust of death. John 19:28-AV After this, Jesus knowing that all things were now accomplished, that the scripture might be fulfilled, saith, I thirst. Matthew 27:46-AV And about the ninth hour Jesus cried with a loud voice, saying, Eli, Eli, lama sabachthani? that is to say, My God, my God, why hast thou forsaken me? l. His resurrection (Psalm. 16:10; Mt. 28:5, 6; Acts 2:31). m. The time of His crucifixion (Daniel 9:26). 1) Daniel's weeks of years was a common way of designating a seven year period (Leviticus 25:8). 2) Sixty nine weeks would equal 483 Jewish years of 360 days each (476 years of 365 days each, according to our calendar. 3) The decree to restore and build Jerusalem was given by the Persian king Artaxerxes approximately 445 B.C. (Nehemiah 2:1-6). Four hundred seventy six years from that time brings us to approximately 31 A.D. The dates usually given for the crucifixion range between 29-31 A.D.
Dr. Nelson Glueck, one of the greatest living authorities on Israeli archaeology has said, "No archaeological discovery has ever controverted a Biblical reference. Scores of archaeological findings have been made which confirm in clear outline or in exact detail historical statements in the Bible" (Rivers in the Desert, New York: Farrar, Strauss, and Cudahy, 1959, p. 31). 1. The roundness of the earth (Isaiah 40:22). 2. The hydrologic cycle (Ecclsiastes 1:7). 3. Atmospheric circulation (Ecclesiastes 1:6). 4. The gravitational field and suspension of the earth in space (Job 26:7). 5. The First Law of Thermodynamics (the law of energy conservation) (2 Peter 3:7). 6. The Second Law of Thermodynamics (the law of increasing entropy) (Psalm 102:25-27). 7. The importance of blood in the life process (Leviticus 17:11; Acts 17:26). 1. A collection of 66 books, written by more than 40 different men over a period of 1,500 years, yet with only one theme from Genesis to Revelation, God's great work in the creation and redemption of all things through His only Son, the Lord Jesus Christ. a. A Redeemer promised (Gen. 3:15) -- A Redeemer given (Gal. 4:4). b. Satan's victory (Gen. 3:6) -- Satan's defeat (Rev. 20:10). c. Paradise lost (Gen. 3:23) -- Paradise regained (Rev. 22:14). a. The Koran (the holy book of Islam) has been in existence only several hundred years and has not been the recipient of attempt to exterminate it. Some parts of the Bible have been in existence for 3,500 years despite numerous attempts to exterminate it, for example, the emperor Diocletian's edict of 303 A.D. stating that every copy of the Bible should be burned. b. Voltaire, the French infidel who died in 1778, predicted that in 100 years from his time Christianity would be extinct. Twenty five years after his death, the British and Foreign Bible Society used Voltaire's own printing presses to print the Bible. 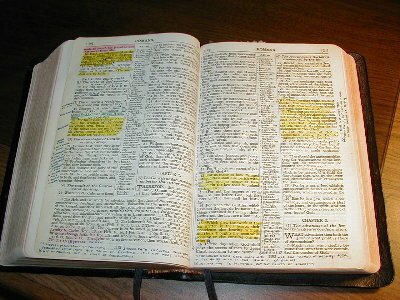 c. Today the Bible is circulated in more than 1,000 different languages. 2. God's particular blessing upon nations which have honoured and circulated the Word of God (Psalm 33:12). 3. The effect of Biblical concepts upon all nations of the world (Isaiah 55:11). 1.The Bible gives spiritual light to those who are in spiritual darkness (Psalm 119:105, 130). 2. The Bible shows us the way to personal faith in the Lord Jesus Christ (Rom. 10:17). 3. The Bible gives the believer assurance of his or her salvation (1 John 5:12, 13). 4. The Bible fully equips the believer to live the Christian life (2 Tim. 3:16, 17). 5. William E. Gladstone, former British Prime Minister said, "If I am asked to name the one comfort in sorrow, the sole rule of conduct, the true guide to like, I must point to what in the words of a popular hymn is called "the old, old story," told in an old, old Book, which is God's best and richest gift to mankind. 6. Woodrow Wilson, former President of the United States said, "The opinion of the Bible bred in me, not only by the teaching of my home when I was a boy, but also in every turn and experience of my life and every step of study is that it is the one supreme source of revelation, the revelation of the meaning of life, the nature of God, and the spiritual nature and needs of man. It is the only guide of life which really leads the spirit in the way of peace and salvation.